I have a four foot Christmas tree given to me by my Gramma Sue and decorated with ornaments made by her and also by my Grandma Charlotte. No two ornaments are alike, and that's the way I like it. 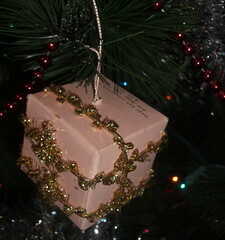 Notice how this is made from some sort of Mary Kay box. 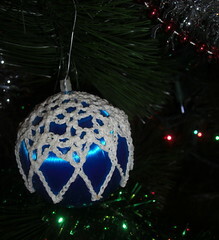 My Gramma Sue crocheted this doiley thing and glued it to the string ornament. You can see the other ornaments here. 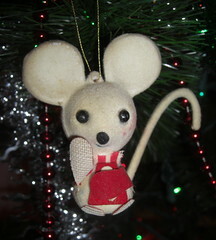 Love the mouse and the crotched ornament. Cool idea. Love your tree.......ours is the same - a mish mosh of various ornaments that survived my Great Grands, Grands, Parents, Myself and now my children.....there is basically 1 ornament left of each collection purchased through the years. And the handmades the kids have done that are hideous.....yet tremendously loved! Amen to the no two ornaments a like. I can't stand trees that have a whole bunch of the same colored glass ball, or ribbons, or whatever. In my ideal Christmas tree, each ornament would have it's own unique story.